Joshua likes to put things in odd places. The other day I was putting on my shoes and couldn’t get my right foot in the shoe, and I found a toy orange he put in my shoe. One day I couldn’t find my keys, and it turned out that he had put them in a small nook in the air conditioner. The other morning I opened up the microwave door to find his toy boat sitting right in the middle of the microwave. I’ve found a variety of toys, cups, crayons in my underwear drawer, and Cliff took weeks to find his drawing tablet pen in a cardboard box in Joshua’s closet. 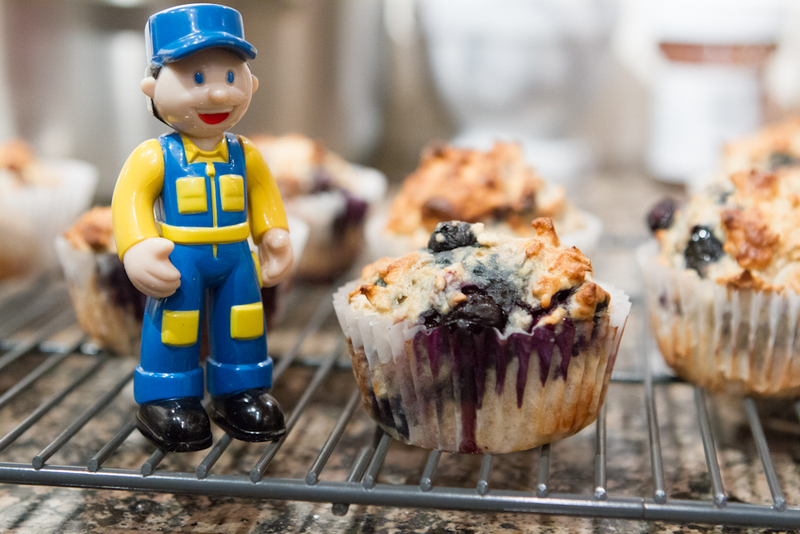 Tonight while I was making these blueberry muffins, I found a train station master in the oven mitt. I have seriously contemplated starting a photo album called “Things that don’t belong”. It would include a picture of my iPod in the toilet. The muffin recipe came from my friend who passed away back in the summer. I love her recipes. This one and the blueberry lemon bar are my all time favorites. No tweaking of her recipe is ever required. Check out her blog HERE and all the great soup recipes too. This entry was posted in Cooking, Family and tagged blueberry muffin, cooking, recipe, things that don't belong by angelasaito. Bookmark the permalink. I found GH’s belt buckle tucked inside Humnoy’s onesie when I went to change his diaper during his nap. Yep, true story.